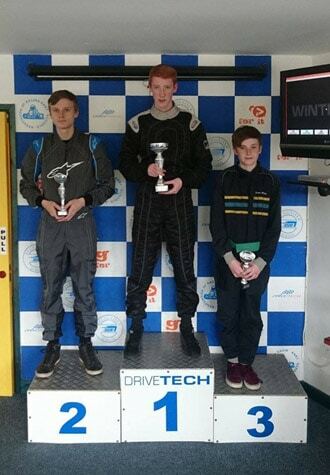 Round 7 of the Junior Karting Championship at Castle Combe took place on Sunday 1st May 2016 and we had 3 stand out drivers making the final. Jack Latus lined up on pole position, making it into the final for the first time after a really impressive run in the heats. Matthew Baker lined up alongside him on the front row. William Jeary another stand out on the day lined up 3rd on the grid, with the winner of rounds 5 & 6 Harry Sadler alongside him. Alex Cameron continues to impress making another final this year, with Matthew Maitland in only his 2nd round making it into the final as well! Jack Latus got a great start and converted pole position into the lead, but Matthew Baker was right on his tail, doing everything he could to get past. Jack held the the lead for a couple of laps, but Matthew was quite a bit quicker and managed to find a way past. Harry Sadler was next to try and make a move and quickly found a way past as well, but Matthew Baker had opened up enough of a gap in the short time. There was then a 3 way battle for 3rd place with Jack Latus now defending from Alex Cameron who had worked his way into 4th. William Jeary was right behind, with Matthew Maitland falling a way a bit at the back. Cameron was able to fight his way past and take 3rd place, while William Jeary made a mistake and hit the wall, dropping back to last. At the flag it was Matthew Baker who took the win, ahead of Harry Sadler with Alex Cameron a very strong 3rd place. Jack Latus took 4th, Matthew Maitland 5th and William Jeary 6th. The Fastest Lap went to Matthew Baker. The driver of the day award was a tough decision, Jack Latus has previously won it this year, so it was too close to call between William Jeary and Matthew Maitland. All three drove brilliantly but it was decided to be a joint winner between William Jeary and Matthew Maitland. Round 8 of the Championship takes place on Sunday 15th May and don’t forget we have a 1 to 1 training day on Sunday 22nd May as well!